The home side created the better opportunities but could not find a winner despite their four-game losing streak coming to an end. Coming into the game on a four-match losing streak, the Latics took the game to Reading, but found their goalkeeper Anssi Jaakkola in inspired form. It took Reading until the hour mark to register a shot on target, when Yakou Meite's effort was blocked by Christan Walton. The result left the Royals in 20th place, with goal difference the only thing keeping them outside the relegation zone. "It was a fully deserved point. We had the better of the chances and a couple of great opportunities to win the game. "After the recent run of defeats that we've had, it's nice to get a point and stop the rot. It's an unforgiving league, we've given some individual errors away but we didn't today. "It was a good, comfortable clean sheet. Unfortunately, we didn't put those chances away." "It was a committed performance from the players. It was a hard-fought game, a good one for a 0-0. "At times we looked better than them, then they looked better. Based on our season and how we've been defending, it's a positive because it's a clean sheet away from home. "We could quite easily have nicked it because I thought we had more control in the later stages, but it's probably a fair result." Match ends, Wigan Athletic 0, Reading 0. Second Half ends, Wigan Athletic 0, Reading 0. Joe Garner (Wigan Athletic) is shown the yellow card. Joe Garner (Wigan Athletic) wins a free kick in the defensive half. 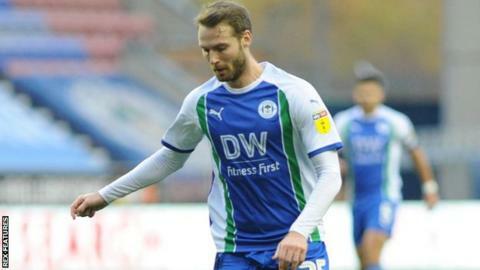 Delay in match Kal Naismith (Wigan Athletic) because of an injury. Corner, Reading. Conceded by Kal Naismith. Attempt blocked. Danny Loader (Reading) right footed shot from outside the box is blocked. Assisted by Marc McNulty. Danny Loader (Reading) wins a free kick in the defensive half. Attempt missed. Josh Windass (Wigan Athletic) left footed shot from the right side of the box misses to the left following a corner. Attempt missed. Joe Garner (Wigan Athletic) right footed shot from the centre of the box is close, but misses to the right following a corner. Corner, Wigan Athletic. Conceded by Tyler Blackett. Joe Garner (Wigan Athletic) wins a free kick on the right wing. Substitution, Wigan Athletic. Callum Connolly replaces Darron Gibson. Substitution, Reading. Marc McNulty replaces Yakou Meite. Corner, Reading. Conceded by Dan Burn. Offside, Wigan Athletic. Darron Gibson tries a through ball, but Joe Garner is caught offside. Substitution, Reading. Josh Sims replaces Garath McCleary. Attempt missed. Darron Gibson (Wigan Athletic) right footed shot from outside the box misses to the right. Substitution, Wigan Athletic. William Grigg replaces Gary Roberts. Corner, Wigan Athletic. Conceded by Liam Kelly. Substitution, Reading. Danny Loader replaces Sone Aluko. Corner, Reading. Conceded by Christian Walton. Attempt saved. John Swift (Reading) right footed shot from outside the box is saved in the bottom right corner. Assisted by Andy Rinomhota. Corner, Reading. Conceded by Gary Roberts. Substitution, Wigan Athletic. Joe Garner replaces Nick Powell because of an injury.